Originally from Ireland, many love the Soft Coated Wheaten Terrier temperament for his playful and kind nature. Wheaten owners consider them to be the perfect companion. Unlike some other terrier breeds, the Wheaten Terrier temperament is usually quite friendly and jovial. Some terriers, like the Jack Russell and Fox Terrier, can be stand-offish and wary of strangers. The Wheaten, on the other hand, is cheerful and very sociable. The energetic Soft Coated Wheaten Terrier temperament has its pros and cons. A high energy temperament can mean he is fun to play with and full of antics, but it can also be a sign that he needs more exercise. Remember, there is a strong correlation between exercise and behavior with all dogs. A breed like the Wheaten Terrier, however, may need more exercise than most to achieve his best behavior. The Wheaten Terrier's joie de vivre leads him to do all sorts of silly things. For one, he is an expert at performing a Tigger-like bounce! This can be really cute and a lot of fun – if, that is, you make sure to teach your Wheaten manners. In other words, you must teach him to respect people’s boundaries. He should not be jumping up on people and knocking them down – that’s a definite no-no. In fact, jumping may actually be his worst personality trait, and one of, if not the most, difficult to control. It is therefore crucial that you nip this in the bud as soon as you possibly can. Let it go on for too long, and it becomes more difficult to rein in. The Wheaten Terrier temperament demands that you sign him up for obedience classes to prevent his clownishness from turning into craziness. They never grow up! Just like a puppy, the playful Soft Coated Wheaten Terrier temperament means your Wheaten will want to kiss you and play with you all day long. If you want a happy-go-lucky companion to wrestle and romp with, the Wheaten is a perfect choice. But, if you are gone from home a lot, then this is probably not the right dog for you. He may develop separation anxiety if left alone for too long. This is not the kind of dog for you if you tend to work long hours, or otherwise spend long periods of time out of the house. The Wheaten Terrier may show signs of aggression toward other dogs of the same gender. Aside from that, though, they are of the “more the merrier” school of thought. These dogs don’t know the meaning of the word “stranger,” which is a very endearing temperament trait – unless, of course, you are looking for a guard dog! Many people believe the Wheaten makes a good watch dog because he will bark to alert you to new arrivals. Just don’t be surprised if your Wheaten tries to kiss the intruder to death! 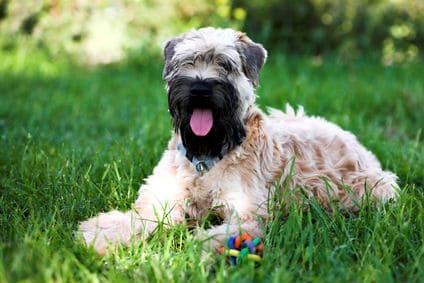 The affectionate Wheaten Terrier temperament means he is loving with kids as well as adults, and they make for the perfect play partner for your child. Just remember that no matter how well you know your dog, it is never a good idea to leave children under 6 years old alone with any breed – even the kind-hearted Wheaten. There is always the chance of a miscommunication that could lead to an accidental injury. There's nothing like a full-on celebration every time you walk through the door to make you feel loved. The spirited Soft Coated Wheaten Terrier temperament means he holds nothing back when it comes to showing you how much you mean to him. From leaps and twirls to joyful barking, Sweetie Wheaties make you feel like you are the most important person on the planet. You can take your Wheaten Terrier with you pretty much anywhere and, as longs as he is with his human family, he will be happy. The average height of a Wheaten is about 18 inches, and they usually weigh around 40 lbs. Their compact size and easy adaptability make them great traveling companions. 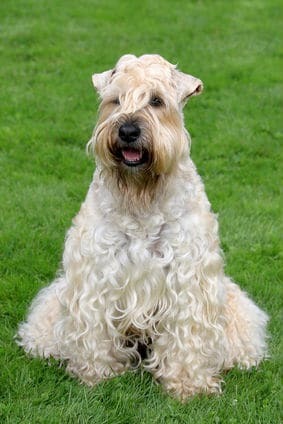 A confident dog is a happier, safer dog, so this aspect of the Soft Coated Wheaten Terrier temperament is a huge plus. The downside to a confident dog is that he can sometimes be a little too independent, which can make them challenging to train. The Soft Coated Wheaten Terrier’s origin in Ireland revolved around the farm. Farmers used Wheatens to herd, watch, and guard livestock. Wheatens also served as the resident vermin hunters. While they share common ancestry with the Irish Terrier, one major difference is that the Wheatens were not pets of the nobility. In fact, the Irish referred to them as the “Poor Man’s Wolfhound.” They would dock the Wheatens tails to avoid taxes and bred dogs to be within a specific size. You must socialize your Wheaten and train him as early as possible to prevent behavioral problems in life. Plus, both things together, when practiced from an early age, can provide your dog with more confidence later in life. As mentioned earlier, the intelligent Soft Coated Wheaten Terrier temperament can make him a challenge to train. So, if you find you’re getting nowhere, enlist the help of a professional to save yourself the headache. Don’t just give up on him, or you’ll have even more problems later in life. You must be firm with your Wheaten without being harsh. Cross that line, and you risk losing his trust and cooperation entirely. The Soft Coated Wheaten Terrier needs a fair amount of grooming maintenance. His name does warn you that he’s not a shorthair, so you should expect more than minimal maintenance. As far as shedding goes, you must brush him daily to help him keep it under control. After brushing comes the combing, and if you find any mats, you can separate them with your fingers. DO NOT use scissors to separate mats, or to give your Wheaten a haircut. This can cause permanent effects as to how his hair grows going forward. If you’re interested in trying out new grooming styles, check with a professional groomer. He may try a “puppy cut,” which you may end up loving on your Wheaten. If you’re looking for a hypoallergenic dog, the truth is that such a thing does not exist. While some dogs have less dander and/or shed less than other dogs, you’ll never know if you’re allergic to a dog until you spend time with one. Like most terriers, Wheatens are pretty scrappy. However, no dog is immune from illness. Wheatens, in particular, can be prone to both protein-losing enteropathy and protein-losing nephropathy. These are kidney diseases that can cause adverse reactions to certain foods. The Soft Coated Wheaten Terrier’s life expectancy is between 12 and 15 years. Note: Don't let the many issues above scare you. The best way to approach health problems is to prevent them in the first place. The Ultimate Guide to Dog Health is a great place to start. Get a copy to keep at home. It will help you prevent the painful health issues that can plague your lovely Soft Coated Wheaten Terrier from expressing his winning personality and maximizing his life expectancy. Are you looking into adding a Soft Coated Wheaten Terrier puppy to your family? You may not know where to start. You can find a Soft Coated Wheaten Terrier either for sale from a breeder or available for adoption through your local animal shelter. The average Soft Coated Wheaten Terrier price is between $800 and $1,000. The variance in the Soft Coated Wheaten Terrier cost depends largely on the breeder. If the breeder is the only one in the area, he or she may charge more. A puppy can also be more expensive if he comes from a line of show dogs. If you want to adopt a Soft Coated Wheaten Terrier puppy, you may be able to find one through your local rescue organization. Adoptions are a great option for people who don't mind mixed breeds, or who want older dogs. You can usually find both in great supply at an animal shelter. If you’re looking into Soft Coated Wheaten Terrier breeders and you’re not sure who to trust, try the Soft Coated Wheaten Terrier Club of America. The club hosts a list of breeders that they recommend and whom they stand behind as reputable breeders. You should put as much research into buying a dog as you do when you go to buy a car. The last thing you want to do is drop hundreds, even thousands, of dollars on a dog, only to learn that he’s sick. Or that he hasn’t had all the shots and tests the breeder should have given him before letting him go. Conclusion: Why the Soft Coated Wheaten Terrier? The Soft Coated Wheaten Terrier temperament traits make him a faithful, playful dog who is everyone’s friend, including children. He requires daily brushings to keep him looking clean and neat. And whatever you do, DON’T try to cut his hair yourself – even if it’s just to free a mat. You may do permanent damage if you don’t trim him properly. Wheatens are confident and adaptable, and they tend to get along with other animals as well. This makes him an ideal dog for any living condition, whether it’s a house with a big backyard or a smaller apartment. The Wheaten is, by his very nature, a family dog. He doesn’t matter where you go, or what you do, as long as you take him with you. So Is the Soft Coated Wheaton Terrier the right dog for you? As you can see the Wheaten temperament makes him fun and funny dog who will make sure there is never another dull moment whenever he's around. If you enjoy the exuberant nature of the Soft Coated Wheaten Terrier temperament, then he will make for a great choice to bring home to your family.